This kit does not include a controller. It can be operated via any PWM output from any microcontroller of your choosing, from Raspberry Pi to Arduino. 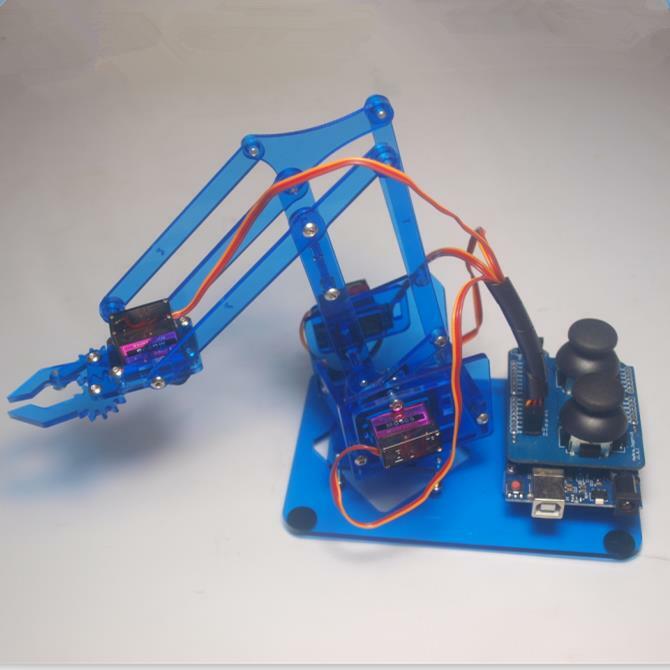 The robot arm kit is a miniature version of an industrial robot arm. So while it’s simple enough to build and use with a child on a rainy Sunday afternoon – it can also be used at more advanced levels of education to teach real robotics. MeArm is a pocket size robot arm. It was conceived to make robotics, electronics and programming accessible – by driving down the cost of robot arm ownership. The ultimate aim is to make something low cost that you can build with nothing but a screwdriver and enthusiasm. MeArm is the world’s most accessible robotic learning tool. It’s a perfect kit for a Maker project or to inspire interest into STEM (science, technology, engineering and mathematics) subjects, introducing engineering, robotics, electronics and opening up a whole world of programming possibilities. The MeArm project is Open Source. This means all of the design and code files are freely available for you to download, so that you can view, edit, learn from all of the work that has been put into the project so far. This covers the files for laser cutting, the PCB board schematics and board files (which are KiCad) and all of the software. Note: This model of the MeArm comes in Color Acrylic.This kit does not come with a controller and not included screws. Images are just for representational purpose.